A period of relatively low volatility saw Bitcoin pull the market into a tight consolidation pattern before some big price swings. 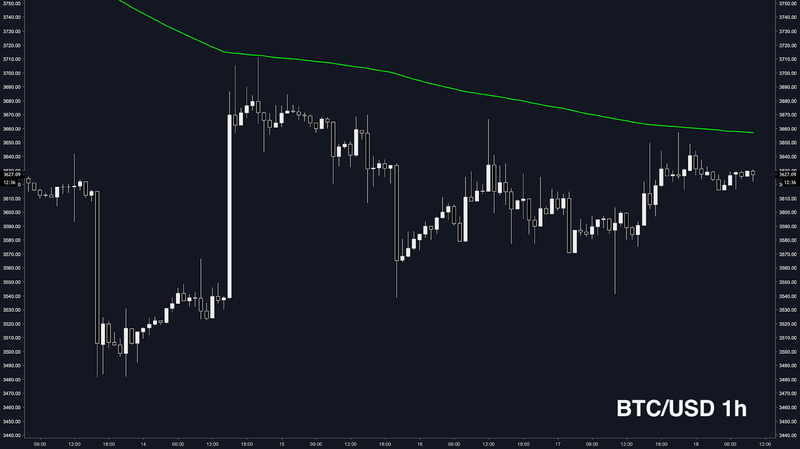 Over the past week, BTC traded in a tight range between USD3,500 and 3,700 with strong rejections off the 200 EMA (shown by the green line below). After a large bullish candle to the upside last week, BTC almost retraced 100% before making a series of higher lows that were also met with a series of lower highs. BTC had been trading into a tight triangular pattern both price-wise and RSI-wise–something we’ve seen many times before. Bitcoin also found a temporary support on top of the 40 EMA (shown by the red line below), while the same line acted as a resistance level for most of last week. Towards the end of the week, volatility returned. After reaching an apex at USD3,620, BTC printed a bull trap with a spike up to previous support levels at USD3,760. Notice the relatively low trading volume on the breakout candle on the 4-hour chart (highlighted by the red arrow below). This suggests that there wasn’t any real support behind this upward move. As a result, the bears took back control and pushed BTC down for a local bottom formation. It's worth noting that there was a lack of volume to the downside here – significantly lower than previous bearish candles of similar size. This suggests a level of uncertainty in the market. Since BTC has now formed a bottom with the low from January 13, we may see potential bullish volume to attempt another break of the USD3,760 resistance. If that doesn’t happen, USD3,100 is still very much in play. Over the past week, Ethereum traded between USD115 and USD132, also experiencing several strong rejections off the 200 EMA. After a large move from USD116 to 132, ETH retraced down 100% before making a series of lower highs and higher lows just like BTC. XRP traded between USD0.315 and USD0.34 this past week, and had a nearly identical chart to BTC and ETH. During times of consolidation, it’s common to see the market follow BTC, and this is what we saw this past week for the most part. Watch the markets closely as prices trade into a tighter range.